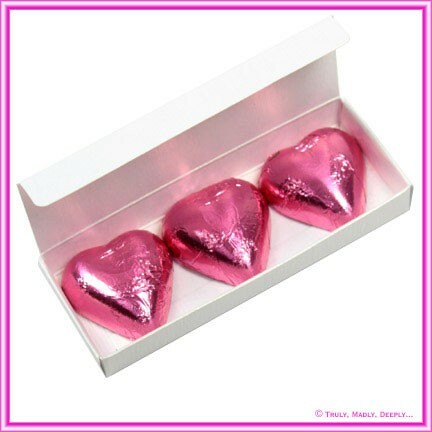 All too often, people are surprised at how many chocolate hearts are required to fill a small bomboniere box. 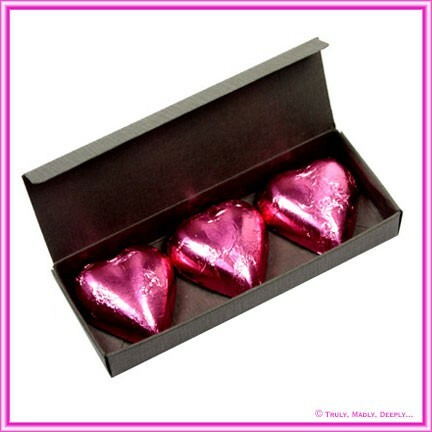 A small box such as a 4.5cm cube takes 5 chocolate hearts to make it look full. When you add up the cost of the box, the chocolates and any additional decoration, the price is often more than the budget allows. We solved the Problem! By working with our suppliers, this bomboniere box is designed to perfectly fit 3 of our foil wrapped chocolate hearts side by side. The fit is so snug that the chocolates don't even move around and your gift will look perfect every time. You can also fill with Jelly beens or sugar coated almonds as well. This box is designed to fit our foil wrapped chocolate hearts. If you purchase your chocolates elsewhere, they may be a different size and not fit this box properly. 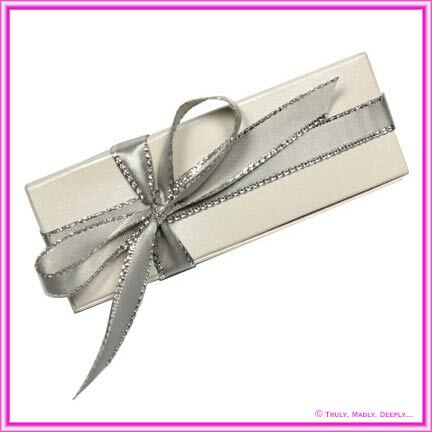 The price is for the box only, the chocolates and decorations, such as ribbons and flowers are sold separately. See below for recommended accessories. Beautiful dusty berry purple / wine coloured metallic card with a stunning pearlescent finish - double sided colour. 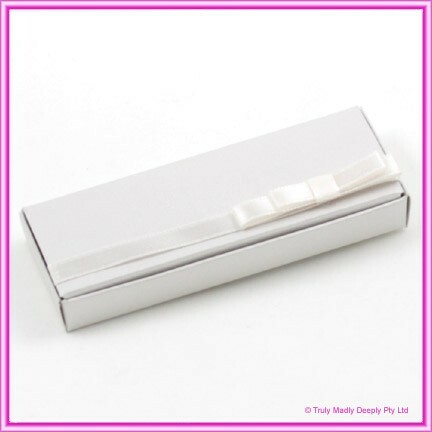 The box measures 10cm x 3.6cm x 1.5cm and arrives flat packed for easily assembly - no glues required, just simple folding. 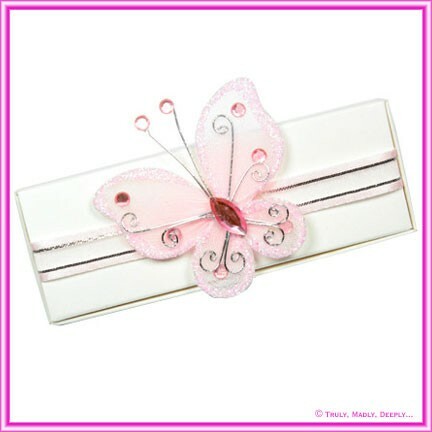 This paper is manufactured in Italy and is converted and packaged by Paperglitz in Sydney, Australia. This is a premium range of papers that has for many years been a favourite for wedding invitations, christening invitations & birthday invitations. This stunning range of papers is also widely used for Annual Reports, Brochures, Menus, Greeting Cards, Invitations and packaging. This range of papers is laser compatible* and as a result it is the widely used for DIY wedding invitations and projects as many standard laser printers that can print on heavy card stock will produce beautiful results. 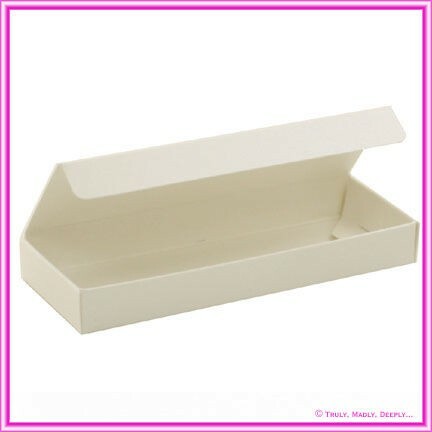 Other box sizes such as 5cm cubes, cake boxes & chair boxes are also available. 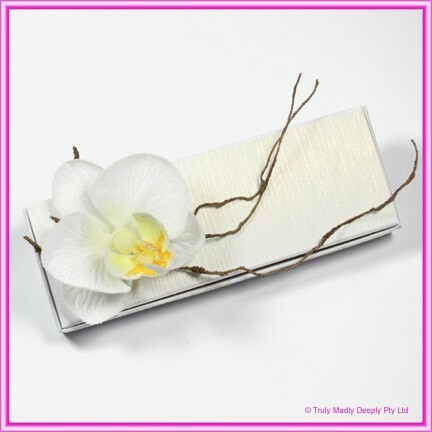 We also carry this colour in 125gsm paper weight, card stock, envelopes, boxes and a wide range of die cut DIY invitation cards. This is Genuine Crystal Perle™ stock from Italy - not a cheap Chinese copy.